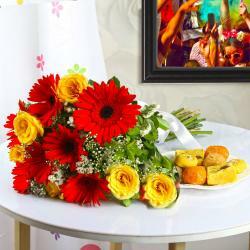 Product Consist : 10 Mix Flowers Basket, 500 Gms Assorted Dryfruit along with 2 Holi Colors. Holi is a Hindu festival that marks the arrival of spring. Known widely as the Festival of Colour. This hamper is one of the nicest thing to have and if your special one is receiving from you so what to say it is a memorable moment for receiver to feel the love with Healthy Holi Hamper of Flowers Basket and Assorted Dryfruit with Colors. 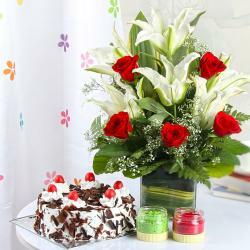 Holi gifts play a significant role to make the recipient feel special. But in such case, you should come up with the best and most suitable gift item. The gift should emit a positive vibration and should covey the feeling of love and respect for the recipient like this flower hamper. Gift your loved ones an essence of our customs and traditions with this exclusive hamper on Holi. An ideal way to make them feel delighted on the festive day. 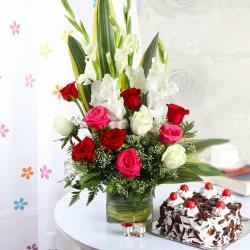 This combo is presented as gift to any one like to your Mother, Father, Best Friend and to many more. This gift is exclusively available at Giftacrossindia.com only. Browse your favorite products, it is very conveniently available for online shopping from anywhere in India with Free Shipping. 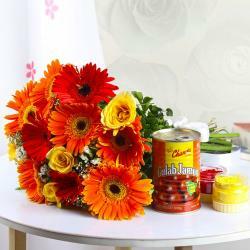 Product Includes : 10 Mix Flowers Basket, 500 Gms Assorted Dryfruit along with 2 Holi Colors.